My Opinion on Sports: Seattle SuperSonics Coming to OKC? The official announcement was made last week that the New Orleans/OKC Hornets will return to Oklahoma City for one more season. Despite the city proving that they can support an NBA franchise and despite players and coaches saying that they prefer they OKC crowd, the plan, according to NBA Commissioner David Stern, is to take the team back to the city of New Orleans even though it struggled to support the Hornets before Hurricane Katrina. Other teams have notice the way OKC has embraced the Hornets and are now looking to OKC as a possible future location. One of those teams is the Seattle SuperSonics according to a story on CBS Sportsline.com. 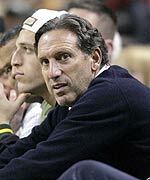 Principal owner Howard Schultz (left) said Wednesday he will look at all options -- including moving or selling the team -- if the state Legislature fails to earmark $200 million for the Sonics to refurbish KeyArena or build a new home. One would be moving the Sonics to a market known to be interested in acquiring an NBA franchise, such as Las Vegas; Norfolk, Va., or Oklahoma City, or to one of three cities -- Anaheim, Calif.; Kansas City, Mo., and San Jose, Calif. -- that have made overtures to Sonics officials, the team said in a statement. There is no doubt that Oklahoma City will eventually wind up with its own NBA franchise and the hope is that it will be the Hornets. However if George Shinn is forced to move back to the Crescent City it’s nice to know that there are other teams who would be willing to move to a city that is anxious to support its own franchise.